02/07/1855 – Glasgow Herald – Notice – I pay John Porter, or any of my workmen their wages daily or hourly if required. Archibald Binnie, Camlachie Brick Work. 19/10/1857 – Glasgow Herald – To be let – A clay field, capable of producing 2 tables of bricks, also 2 stables of 4 and 8 stalls respectively with hay lofts and 2 small dwelling houses attached. The above are situated at Camlachie and will be let together or separately with immediate entry. For further particulars apply to William Guild, Proprietor, Porter Street, Camlachie. 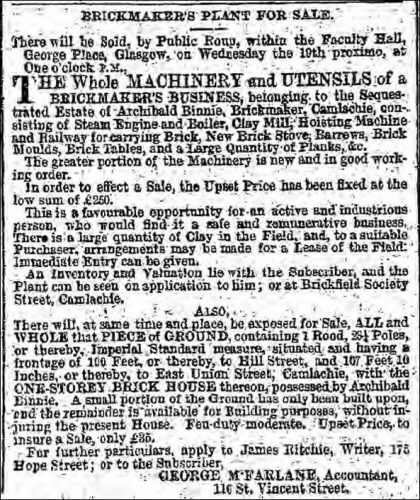 21/05/1858 – Glasgow Herald – To potters and ironmasters – Pugged clay for sale at Camlachie Brick Work, Porter Street wither on the field or delivered by ton or for the season. Orders sent to Wm Guild, at the field, or to Peter Young, 475 Gallowgate. 07/07/1860 – Glasgow Herald – Scotch Bankrupts – Examinations – Archibald Binnie, brickmaker, Camlachie, Glasgow, to be examined within the Chambers of Mr. Sheriff Strathern, Court House, Glasgow, 13th July, at twelve o’clock. Creditors to meet within the Counting House of George McFarlane, accountant, 116 St. Vincent Street, Glasgow, 24th July, at one o’clock. 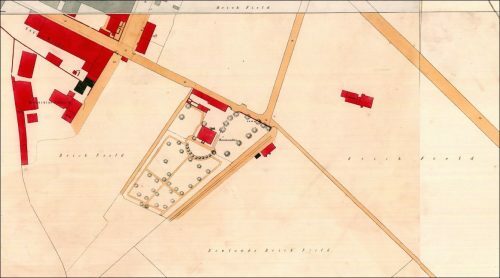 Below – 13/08/1860 – Glasgow Herald – Brick works at Camlachie , to the South of Shotts Road to let. Proprietor Mr Guild. Below – 31/08/1860 – Glasgow Herald – The Estate of Archibald Binnie, Brickmaker, Camlachie for sale. 09/11/1860 – Edinburgh Gazette – George MacFarlane, Accountant in Glasgow, Trustee on the sequestrated estate of Archibald Binnie, Brickmaker, Camlachie, Glasgow, hereby intimates, that his accounts with said estate, till 25th ultimo, have been audited by the Commissioners, who postpone declaring a dividend till next stated period. George MacFarlane, Trustee. Glasgow, November 7, 1860. 12/06/1861 – Edinburgh Evening Courant – Scotch Bankrupts – Dividends – Creditors of Archibald Binnie, Brickmaker, Society Street, Glasgow will receive a dividend at the chambers of George McFarlane, accountant there, 26 July. 03/07/1863 – Glasgow Herald – A brickfield to let – At Porter Street, Camlachie, capable of working two tables and upwards. Machinery on the ground and clay for a million bricks raised, ready to commence making. Also, another brickfield adjoining, capable of working five tables (Entry at Candlemas, 1864), to which an additional acre of ground can be attached. Offers to be sent, for one or both Fields, before 2nd August, to Mr. Peter Young, 11 Miller Street, Glasgow; or the Proprietor, Mr. William Guild, Broomhill, by Greenhill (Post Town, Denny).